Successfully Added Tactical Special Forces Torch with High Intensity Beam to your Shopping Cart. 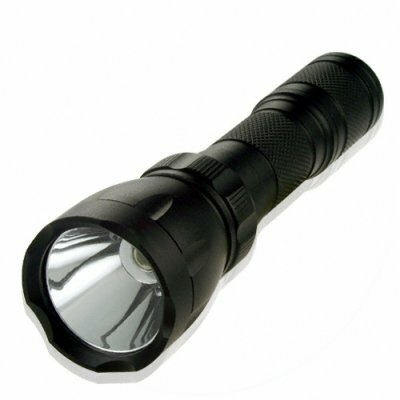 Tactical special forces torchlight with high intensity beam. Turn night to day with this impressive Super Bright Torch Light. This high-intensity flashlight is constructed from high-grade turned aluminum and is knurled for a sure, non-slip grip. The simple but effective construction process ensures easy battery changing and operation even in the roughest of outdoor conditions, and operating in all weather types. This robust and compact flashlight in a tough casing would be an ideal accessory for the car, boat, toolbox or even around the home for emergency use. Effective as a defensive tactical item, this matte black torch would surely ruin an intruder's night vision and allow for an easy escape or counter attack. This is the torch for people who demand that things are always done right with its commanding beam of light. Another great wholesale product at a low factory direct price from the leader in new high-tech gadgets - Chinavasion! Probably the brightest hand-sized flashlight you've ever seen! just recieved yesterday but wow what a flashlight i am thinking about to order a few more and the service very good!!! i am from the netherlands with in 3 day it arrived damn fast. I am very impressed, and am ordering another one. The battery lasts forever, and it is fairly sturdy. Very bright, and powerful. Nice Flashlight very bright and small!